Does your child enjoy their school dinner? The Education Policy Institute and CooperGibson Research are exploring how free school meals for infants are delivered in schools. 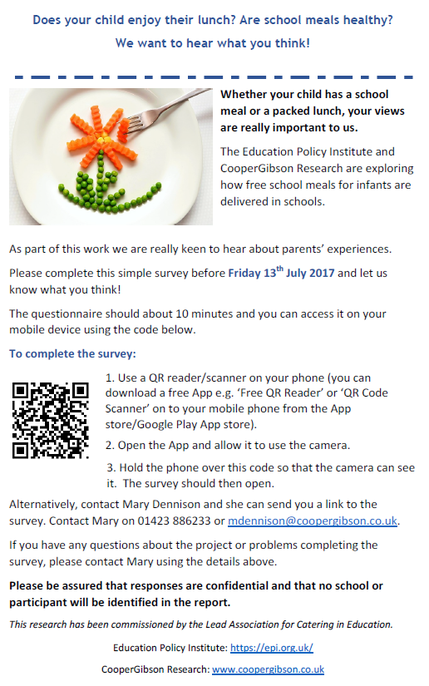 As part of this research they are really keen to hear about parents’ experiences, whether your child has a school dinner or a packed lunch please complete this simple 10 minute survey before Friday 13th July 2017 and let us know what you think! To complete the survey please follow the link below.